The early 80s were a funny time in gaming, both for me personally and for the hobby generally. By "funny," I mean a combination of "interesting" and "unusual." Gaming, particularly fantasy gaming, was now firmly ensconced as a popular pastime, with everyone trying to cash in on the craze. And there was lots of experimentation with different rules, formats, styles of presentation, and so on. The result was a kaleidoscope effect, making my visits to places like The Compleat Strategist simultaneously exhilarating and confusing. What were all these different games and which ones would I like? There were reviews in Dragon and White Dwarf, of course, as well as the opinions of the guys in the game store, but, even then, I knew that reviews didn't tell the whole story and that the opinions of reviewers didn't always jibe with my own preferences. There was also the fact that, then as now, D&D exerted a strange effect over most gamers. By 1982, D&D was starting to feel a little "stale" to me and I was keen for new gaming horizons. It's not that I didn't play other RPGs -- I did, particularly Traveller and Call of Cthulhu -- but D&D was my introduction into the hobby and had left its mark on my imagination in a way no other game ever would. Consequently, even when I was looking to replace D&D with another game, D&D was still there in my mind. It was the game against which I was judging other games and I know now that that probably lessened my ability to give other RPGs the fair shake they deserved. It was in this context that Swordbearer entered my life. I knew Heritage Models quite well, having purchased many of their miniatures and having enjoyed their Dwarfstar microgames like Barbarian Prince and Outpost Gamma (both of which, along with the rest of the line are available as free electronic downloads at this site, thanks to the kindness of their current copyright holder, Reaper Miniatures). So, when I saw this odd little boxed game, which proclaimed its contents to be "realistic, fast-playing, complete, expandable," I picked it up, hoping to find a game to cure my D&D malaise. I read Swordbearer with great relish. Consisting of three landscape-format books of varying length (illustrated throughout with black and white art by the then-unknown Denis Loubet), Swordbearer wasn't quite what I expected. The game has no classes, being a skill-based one in which any character can conceivably learn any skill. The system isn't particularly complex by today's standards, but it seemed a fair bit more involved than D&D. That made it harder for me to get into it than I'd hoped, but I soldiered through nonetheless. The magic system is interesting and based on a node system that's inspired by a modified version of Asian elemental theory. There's also spirit magic that's based on the four humors of classical Western medicine. What set Swordbearer apart, though, was its broader "social" focus than D&D. There were many, many more playable intelligent races, including the bunrabs, an obvious nod to designer Dennis Sustare's earlier Bunnies & Burrows RPG. This made it possible to create a campaign that felt very different than the implied pseudo-medieval setting of most of the fantasy RPGs with which I was familiar at the time. There were also rules about social status that tied into the game's abstract wealth system, as well as just what being a member of a particular social class meant in the context of the game world. All of this may seem like old hat nowadays, but, in 1982, it was a revelation to me and it gave Swordbearer a "serious" feel to it that both impressed and frightened me at the same time. 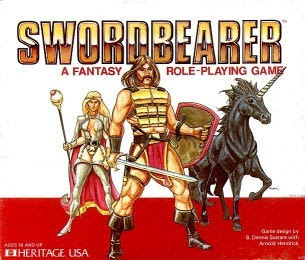 I very much wanted to play Swordbearer, but didn't think I was "good enough" a referee to do so, a feeling I'd also gotten from RuneQuest, another game I owned but never really managed to play. Looking back on it now, I feel bad I never had the chance to try out Swordbearer with my friends. I think, even though the gravitational pull of D&D ultimately proved irresistible, my gaming would have benefitted a lot from having had the chance to test out some of Swordbearer's innovations. After my recent interview with its designer, I dusted off my copy from the garage and have begun re-reading it and it's quite the trip down memory lane. It's also sparking some ideas in my head that might see use in my Dwimmermount campaign. Copies of the game pop up on eBay fairly regularly and the ghost of Fantasy Games Unlimited (which published the game's second edition) sells both PDF and print copies here. You might consider picking up a copy, if only to see firsthand some of the diversity the gaming of the early 80s had. It really was a magical time, both for the hobby and the industry, and we shall not see its like again. I did get to run it a bit, and I found it to play pretty smoothly. But, yes, it is a treasure of ideas, to be certain. I once had a copy of the Heritage games edition of this game, and would like to have a replacement since it's long gone. I do have the FGU edition, but from my own memory, I liked the format of the Heritage edition better. I have the Heritage USA edition of this game as well as FGU's "Dwarven Halls" supplement. Both are high-quality products well worth mining for ideas. I also love the art in both (Denis Loubet in the first, Liz Danforth in the second). Oh, and I also love that the group on the box cover could easily be a Swordbearer adventuring party, unicorn included. I felt the same as you, James. I bought the original Heritage Games version - it was the graphic on the cover of the box that sold me - but was completely daunted by the system (which was almost completely incomprehensible to me, as my experience focused squarely [and solely] on AD&D up to that point). I've always regretted never running Swordbearer with my players, and have even considered picking up the PDF (thanks for the link!). I thought about buying this on FGU's website. I loved Heritage minis! They were top drawer! I've still got some of the Star Trek line and some of their fantasy miniatures. They also had a great Lord of the Rings and Barsoom lines also. I was gaming back in the early 80s and remember seeing ads for all kinds of games like Swordbearer in Dragon. But we didn't have a game store around, so the only non-D&D games I played 'til later on were Gamma World and Traveller. FGU stands out as a company that produced a separate RPG for everything, which was kind of funny. I have no idea if any of them were any good. This was probably one of the first games that for me that truly connected the idea of wealth and social status and the role of the player-character in the larger community (instead of just someone passing through it). Even Chivalry & Sorcery didn't have as profound an effect (it was still too close to it's D&D roots to make much of a distinction). And I loved the Denis Loubet art. Still do. Nice! I still have copy of the FGU edition. Swordbearer was quite ahead of its time in many ways. I think a retro-clone would be a worthy project. One interesting thing about Swordbearer is that it may be the earliest RPG that dispenses with the Old School/Swords and Sorcery trope that adventuring is about gathering treasure. I mean, I think there was a mechanism for getting enough treasure to raise your social status, but the abstract nature of it made it much less compelling as a goal. I'm starting a new Swordbearer campaign this month set in early medieval Britain - with a huge slice of fantasy added for extra bite. It's an outstanding game that's never lost its edge. FGU produced many excellent games: Swordbearer, Bushido, Flashing Blades, Villains and Vigilantes, to name but a few. Far superior to most of TSR's contemporaneous output.